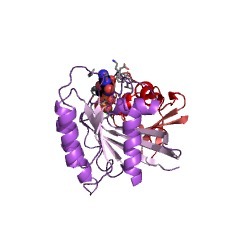 Ras and heterotrimeric G proteins' alpha subunits are signal-transducing GTPases that cycle between inactive GDP-bound and active GTP-bound forms. The activities of these GTPases are regulated in part by GTPase-activating protein (GAPs) that stimulate hydrolysis of GTP, and guanine nucleotide exchange factors (GEFs) that stimulate GDP release. Ras and G alpha GTPases are prolific signalling molecules interacting with a spectrum of effector molecules and acting through more than one signalling pathway. 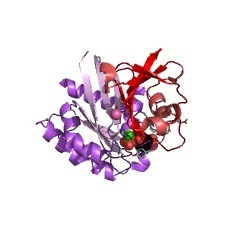 The Ras-binding domain (RBD) is an independent domain of about 75 residues, which is sufficient for GTP-dependent binding of Ras and other G alpha GTPases. 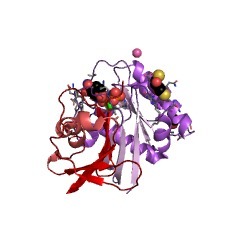 The RBD domain can be present singly or in tandem and it can be found associated with many other domains, such as PDZ, RGS, PID, PH, C1, DH, or protein kinase [(PUBMED:10606204)]. 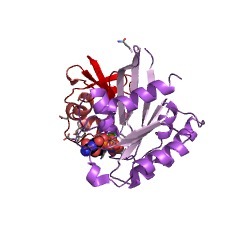 Structurally, the RBD domain of Raf-1 consists of a five-stranded mixed beta- sheet with an interrupted alpha-helix and two additional small alpha-helices. 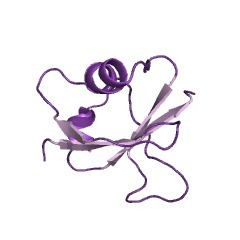 The structure of the RBD domain belongs to the ubiquitin alpha/beta roll superfold and is similar to that of the RA domain despite the lack of significant sequence identity. 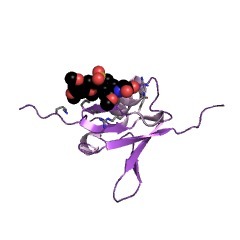 The major interaction between Ras and Raf-1 RBD domain occurs between two antiparallel beta-strands: beta 2 of Ras and beta 2 of RBD [(PUBMED:7791872)]. 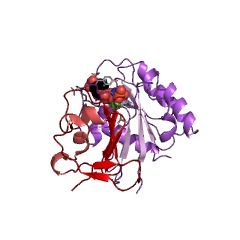 This entry represents the entire RBD domain. 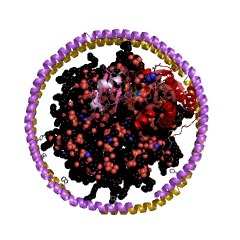 There are 4454 RBD domains in 3476 proteins in SMART's nrdb database. Taxonomic distribution of proteins containing RBD domain. This tree includes only several representative species. The complete taxonomic breakdown of all proteins with RBD domain is also avaliable. Click on the protein counts, or double click on taxonomic names to display all proteins containing RBD domain in the selected taxonomic class. 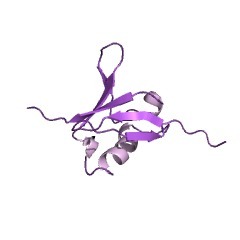 Interaction of 14-3-3 with signaling proteins is mediated by the recognition of phosphoserine. The highly conserved and ubiquitously expressed 14-3-3 family of proteins bind to a variety of proteins involved in signal transduction and cell cycle regulation. 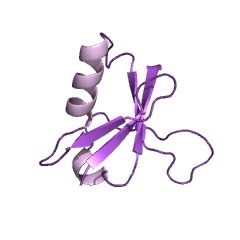 The nature and specificity of 14-3-3 binding is, however, not known. 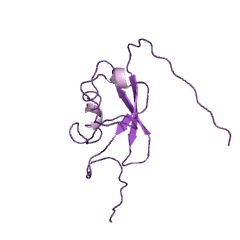 Here we show that 14-3-3 is a specific phosphoserine-binding protein. 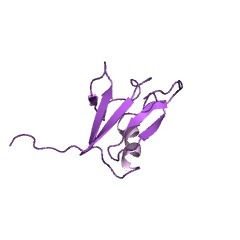 Using a panel of phosphorylated peptides based on Raf-1, we have defined the 14-3-3 binding motif and show that most of the known 14-3-3 binding proteins contain the motif. 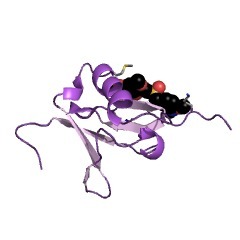 Peptides containing the motif could disrupt 14-3-3 complexes and inhibit maturation of Xenopus laevis oocytes. These results suggest that the interactions of 14-3-3 with signaling proteins are critical for the activation of signaling proteins. Our findings also suggest novel roles for serine/threonine phosphorylation in the assembly of protein-protein complexes. This information is based on mapping of SMART genomic protein database to KEGG orthologous groups. 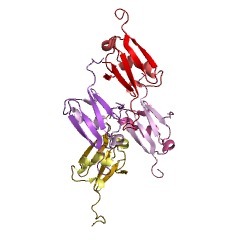 Percentage points are related to the number of proteins with RBD domain which could be assigned to a KEGG orthologous group, and not all proteins containing RBD domain. Please note that proteins can be included in multiple pathways, ie. the numbers above will not always add up to 100%. 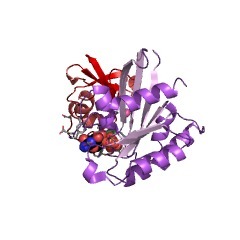 1c1y CRYSTAL STRUCTURE OF RAP.GMPPNP IN COMPLEX WITH THE RAS-BINDING-DOMAIN OF C-RAF1 KINASE (RAFRBD).